More than ten years ago, then-Mayor of Suwanee Nick Masino took me and several others on an impromptu trip to see what was new in the then-sleepy city that sits on the rail line between Duluth and Buford in Gwinnett County. We drove up Buford Highway to just south of its intersection with Lawrenceville Suwanee Road, where we got out of our cars to look at a large open space with an just-built amphitheater at one end. Nick pointed to the thick woods just south of the park. The city owned that area too, he explained. It was going to be built out with areas for retail, offices and residences. This drawing of the proposed development was submitted to Gwinnett County for review. What Masino, who is now Vice President of Economic Development at the Gwinnett Chamber, showed us was to become one of the biggest success stories in the metro area, Suwanee Town Center. It, along with other developments including Atlantic Station, downtown Woodstock, and Alpharetta’s Avalon development are examples of mixed use development that appeals both to millennials, who prefer living in places where they can walk to entertainment and shopping, and aging baby boomers, who are ready to give up their large-lot subdivisions and move to locations providing easy access to services they need and want. Larry Bost, of Marietta, has been pushing an idea of late that may find some support among suburban commuters. His proposal, which is surprisingly well researched, involves the construction of a monorail along the pre-existing interstate system surrounding Metro Atlanta. In this proposal, green and blue lines represent inbound and outbound monorail lines, while yellow dots represent transfer stations. Such a monorail, he says, would be a far more worthy investment than our continual expansion of highways surrounding Atlanta. He’s drawn up a plan that outlines 15 different stations for the proposed metro Atlanta monorail, with seven stations outside the Perimeter, seven along I-285, and only one station inside the Perimeter. One key advantage of a monorail system in Atlanta is that it planners would simply build on top of the existing highway system along the center of expressways, eliminating the need for any additional land acquisition. The costs, according to the Monorail Society, vary greatly depending on factors like the total length of the system, the number of stations, the speed of the train, and the topography of the land. Given that variability, a monorail system could cost anywhere between $10 million to $100 million per mile of track. For comparison, the US Department of Transportation estimates that the construction of a new highway in urban areas can cost between $4.9 million to $19.5 million per lane mile, while simply adding a new lane to an existing highway can run anywhere between $2.4 million to $6.9 million per mile (twice that if adding a lane to each side). But as both the Monorail Society and Bost emphasize, a monorail has the best chance of turning an actual profit once constructed. Outside the United States, other countries have used monorails with incredible success. For the 1964 Olympics, Japan built a monorail for Tokyo, and the system has turned a profit every year since. China opened a 62-station, 34-mile long monorail in Chonggung in 2005 and will likely continue investing in the technology in the future. Even India has recently come on board with the idea, investing $2 billion in a 35-station, 36-mile long monorail system in Chennai. Additionally, monorails are different than urban subway systems in that their target clientele consists of suburban commuters. In a city with notorious sprawl out to the suburbs and with suburban voters typically less willing to fund urban transit systems, Atlanta could be the perfect candidate for monorail construction in the United States. As the legislature continues to toss around ideas about how to improve Georgia’s crumbling infrastructure, a suburban monorail is an idea at least worth considering as just one part of the solution to Georgia’s transportation woes. The exact amount the city owes the school district is in dispute. But what’s clear is that the Beltline is currently behind on a $6.75 million payment that was due last January, and is set to owe an additional $6.75 million next month. The parents contend the city should also pay interest and attorneys fees associated with the debt. To gain a better context of the issue at hand, one would have to go back in time to 2005 when Mayor Shirley Franklin created the Beltline Tax Allocation District (TAD) for which she requested a buy in from the APS and Fulton County. Under the original Beltline TAD plan, Atlanta Public Schools, Fulton County, and the City of Atlanta would agree to forgo the property tax revenue they received in order to have this revenue go towards the Beltline project. The plan was to have these revenue payments stop once the Beltline was completed by 2030. In return for their cooperation, the schools, county and city would reap better communities and higher property tax income. However Mayor Franklin agreed to make fixed payments to APS through 2030 for a wide variety of reasons in addition to making fixed payments of a lower amount to Fulton County through the TAD. While the Beltline has upheld these payments to the County, it has been unable to do the same with the APS. The Beltline claims it has not been able to make these payments to the APS for two main reasons: a lawsuit and the Great Recession. While the lawsuit temporarily kept the Beltline from using school taxes, the Great Recession has led to the TAD only raising one third of the funding for the Beltline as opposed to the originally projected 60 percent. To complicate things further, during the duration of the lawsuit, the property tax revenue that would have gone to the Beltline was held in escrow and not invested in the project. In 2009, city officials signed a contract agreeing to let APS keep these funds, amounting up to $26 million. The agreement specifically stipulated that this money would not be credited towards the Beltline’s debt. Ever since then, City and APS officials have unsuccessfully attempted at negotiations to amend this deal. Meanwhile, city leaders simply want to make progress on completing the project. With progress delayed due to the recession, they fear making payments to the school system would cause further construction to grind to a halt. What will metro Atlanta look like 25 years from now? There are many things to consider about that question. Some are fairly obvious. What kind of land use and development patterns should we follow in order to deal with the estimated three million additional residents the area is expected to have by 2040? What type of transportation solutions should be implemented in order to move all those people around? Others require some more thought. How can we guarantee a reliable water supply for the area’s residents? What does the area (and Georgia) have to do in order to ensure a trained, qualified workforce for the jobs of the future? How do we deal with a population that will have an ever-increasing number of residents over the age of 65? For each of those issues, there are a wide range of possible solutions. Some will be easy to implement, while others will require a significant capital investment. Many will require building a consensus among residents before they can be implemented. The Atlanta Regional Commission is beginning the process of developing a plan for 2040. This year, thy are soliciting input and looking at various options. In 2016, they will develop their plan, and they expect to adopt the final version sometime in 2017. Right now, they are looking for your input. You can provide it here. In my recent dealings with Ms. Burwell, I’ve had concerns about her willingness to ignore the clear intent of Congress and text of duly enacted laws. Before she is promoted to run Obamacare – a program where this administration continues to illegally ignore the text of their own law – I need to have a better explanation about why she has ignored the direction of Congress as it relates to the Savannah Harbor Expansion Project. Burwell, or at minimum her office, was responsible for the Savannah Harbor Expansion Project not being funded in the President’s budget request this year, despite the direction of Congress. News reports say the President nominated Burwell as Sebelius’s replacement in order to avoid a confirmation fight with the Senate. It will be interesting to see if Chambliss (and fellow Senator Johnny Isakson) will try to pick one. Oh, and apparently Burwell was also the person responsible for closing the national parks, veterans memorials and the rest of the government last year. The snow had hardly settled Tuesday night before the SnowedOut Atlanta blame game had begun. Now, it’s in full swing. The mayor (see above) is to blame for thousands of people getting stranded on your local streets. Gov. Nathan Deal is to blame for not planning far enough in advance to have DOT crews out, salting the interstates. Schools are to blame for sending kids home too late in the day, stranding them on school buses on gridlocked-highways or forcing them to spend the night at the school gym. Businesses are to blame for not sending their employees home sooner. Or sending them home when everyone else was going home and the school buses were trying to get the kids home. The National Weather Service and your favorite meteorologist are to blame for not predicting that the storm would hit farther north of the Gnat Line. But what about the issue of personal responsibility when it comes to making the decision to drop what you’re doing, get your family safe and get home? I’m not saying that the eight-month pregnant woman stranded for 14 hours on Langford Parkway was to blame for her predicament. Nor am I blaming a good friend for a nine-hour trek that only succeeded in his car winding up in a ditch. And I have nothing but heartfelt condolences for the hundreds of kids whose first night away from home was in a school gym. But we all knew this was coming as early as 5 pm on Sunday, when the National Weather Service first issued a winter storm watch. By Monday night, everyone knew that at least an inch of snow was on the way. We certainly haven’t heard the last of this. On Wednesday night, Georgia Democratic Party chairman DuBose Porter told All News 106.7 that Deal “got caught with his britches down.” State Sen. Jason Carter is bound to mention this once or twice or a couple of hundred times between now and November 4. But I’d like to hear if anyone can specifically say what they would have differently if they were in charge, instead of playing the blame game. Outside groups often use the early days of the General Assembly session to present information to legislators that they hope will be topics for discussion and action later on. So it was on the opening day of 2014’s session, when the Georgia Section of the American Society of Civil Engineers released a report card on the Peach State’s infrastructure, the first in five years. In a nutshell, we could do better. The state’s rail, energy, and aviation infrastructure rated the best, with B or B+ rankings. The state’s dams and transit infrastructure were the worst with D- ratings. The Georgia legislature needs to fund and properly staff the Georgia Safe Dams Program. Congress must allocate Federal funding to deepen the Port of Savannah. The state, and especially the Atlanta region must develop a regional, accessible transit system. Local governments must adequately fund their stormwater infrastructure. With the state ranking 49th in funding, Georgia must find some way to fun needed road improvements. The Atlanta Regional Commission is about to release Plan 2040, which addresses transportation infrastructure improvements over the next 26 years. According to the AJC, the one quarter of the $59 billion plan will be used for improvements, while the rest will be used to maintain current roads and bridges, and pay off debt. For those of you, like me, who are not opposed to a Falcons Stadium, but think it can be privately funded, I’ve set up this form you can use to contact the Governor and members of the legislature to voice your opposition to the $300 million. Alternatively, if you support the stadium, you can change the suggested text and use the form as well. 643,193 Voters on TSplost Day, July 31. Who Were They? There were 643,193 voters who voted in the July 31 primaries in the 10 Metro Atlanta Counties — aka the “Atlanta T-Splost Region.” Here’s a quick review of the demographic and political composition of the voters that day. Recently I attended a Legislative Briefing sponsored by the Georgia Public Policy Foundation and the Conservative Policy Leadership Institute. The final topic of the day was transportation and what to do in the wake of the TSPLOST rejection. Kelley McCutchen offered the plan which relies on bus rapid transit as an alternative to light rail and alternative routes around Atlanta and across Georgia. It is very evident that we must build trust. We believe we need to build trust though Transparency, Reform and Performance. One simple way to increase transparency is to broadcast the GDOT board meetings on the Internet, just as many other state board meetings are made available to the public. We need reform. We’ve heard many ideas and we’re not sure which are the best. One common complaint is we need to do something about the “alphabet soup of agencies.” We believe there is an opportunity to simplify governance by consolidating some of these agencies. The gas tax is a short-term solution – not just for us but for every state and for the nation. We have 5-10 years before we have to make some fundamental decisions about how to fund transportation. That window gives us an opportunity to build trust through performance. Actions speak louder than words. The GDOT was #1 and #2 in the nation last year in bringing projects in 1) on time and 2) on or under budget. That’s the kind of performance we need to continue. So how do we pay for this? GPPF offers several options: changing the gas tax, putting all the gas tax toward transportation (which will require either budget cuts or replacing that revenue in the General fund), toll lanes, and/or sales taxes devoted to transportation. This is a serious plan worthy of debate. Hopefully nobody came out of the TIA debate thinking the status quo is acceptable. We in the Legislature need to take this issue up and I hope the GPPF plan is part of the discussion. The following post was written by Brett Bittner, executive director of the Libertarian Party of Georgia, and vice president of the Cobb Taxpayers Association. After serving on the Steering Committee for last summer’s “Get A Move On” Townhall, I was asked by the Civic League of Regional Atlanta to respond to three questions regarding the upcoming voter referendum on the Transportation Investment Act of 2010. What’s good about the Transportation Investment Act? When the Transportation Investment Act passed in 2010, it showed a genuine concern for the transportation issues here in Georgia, especially metropolitan Atlanta. Its passage also indicated a desire to address the failed attempts of the centrally-planned Georgia Department of Transportation attempts to improve the seemingly endless commutes for Atlantans. Legislators presented municipal and county officials an opportunity to work together to relieve congestion woes in a cooperative and efficient manner. I appreciate the attempt, as well as the willingness to cede authority to bodies with stronger ties to the communities served in each region. Rather than attempt further planning at the state level, the TIA brings cities and counties with similar struggles and interests to the table. What’s bad about the Transportation Investment Act? While the above attempts are admirable, the reality of the product returned is filled with projects that lack the intentions of the legislators who voted to pass the bill two years ago. Several legislators who voted for the bill have reconsidered their support after seeing the resulting project list prepared by the Atlanta Regional Roundtable. While roundtable members winnowed a massive “wish list” down to what could fit into the estimated revenues generated, those members pushed the goals of decreased congestion and increased mobility aside in favor of the vague and unquantifiable concepts of “economic development,” “livability,” and “jobs” that proponents and “education efforts” alike utilize when discussing the referendum. The project list completely lacks any item that directly correlates cost and use. The most efficient allocation of funds occurs when there is a direct correlation between these two factors. The voter referendum considered July 31st only authorizes spending for the construction and implementation of the projects contained within the list without a mechanism to “invest” in the operation and maintenance of the $6 billion worth of new transit project “wants” in a region that needs solutions, rather than what amounts to taxes disproportionately allocated when compared to real world use. Both sides agree that over half of the taxes to be collected fund mass transit projects. Historically, use of mass transit in our region does not exceed 5% of the population and is in a state of declining use, so what sense does it make to have the whole pay for a majority of transportation options that less than 1/20th of us utilize? What’s the bottom line for (your organization)? Both organizations I lead encourage a “No” vote on the July referendum, as the projects do not adequately address the mobility and congestion issues that the Atlanta region faces. Both the proponents and opponents point out that there is no “Plan B,” which implies that the regional roundtable gave voters an “or else” ultimatum, rather than seeking a solution that solves the transportation issues facing the region. The General Assembly gave a tremendous amount of control and authority to a regional body in hopes of regional solutions, but received only favors to special interest groups and a mentality of “What can I bring home to my constituents?” in return. After voters reject the referendum, start from scratch to determine the actual needs of the region, by including stakeholders in the discussions, rather than a handful of officials no one elected to represent them in this effort. Focus the production of a project list that addresses the issues of mobility and congestion with a strong relationship between the two using the resources and their level of commitment to fund them. Rather than continue the monopoly over such decisions to an overburdened and ever-growing leviathan government, allow private companies to propose projects they can build, maintain, and operate efficiently and independently of bureaucrats and a regional government entity. How is that for a starting point from which to begin “Plan B” when voters reject this tax increase? My father always says, “It’s not a bargain if you can’t afford it.” I believe that is the advice he might pass along to MARTA supporters. MARTA has long desired more flexibility in its ability to determine how it will spend its funds. Currently, 50% of MARTA funds must be spent on capital improvements and 50% on operations. This is a fairly tight financial straitjacket, though it is a way to prevent subsidization of riders at the expense of abandoning necessary upkeep of the system. To free MARTA from the state-imposed restriction that 50 percent of its revenues be spent on capital and 50 percent be spent on operations, MARTA basically would have to turn over most of its authorities to the newly-created Transit Governance Council. For the record, no other transit agency in the nation is saddled with such an unworkable rule. MARTA represents a $6 billion investment in our region. Why should MARTA turn over its Constitutional powers to a state-controlled entity and give up its designation as the transit authority that can receive federal funding in the region. According to folks close to MARTA, relaxing the 50/50 rule would give MARTA flexibility over how it spends its sales tax revenue (and it is expected that currently would be worth about $20 million a year for the transit agency. It is inconceivable that MARTA could or should give up most of its powers and its $6 billion investment in return for getting flexibility in how it can spend the MARTA sales tax collected in the City of Atlanta, and Fulton and DeKalb counties. And then there is the issue of the make-up of the Georgia Regional Transportation Authority (GRTA) which would be the body with the ultimate control of MARTA. The 15 members would all be appointed: 9 by the governor, 3 by the lieutenant governor and 3 by the state house speaker. It’s not as though petty, personal politics ever happens in Georgia, so what could possibly go wrong? From the state’s perspective, things are different. One of the complaints about the state is that it has not contributed as much money to MARTA as is needed. It is a fact that state governments are reluctant to give up control of funds, but let’s take this a step farther. If the state increases its control of the funds, then it has greatly increased its responsibility for MARTA. It can no longer stand at a distance and point fingers. It will be forced to have a hands-on, problem-solving approach and let’s face it, the state has many more resources at its disposal that it could employ to improve MARTA – if the price is right. In this case, the price for the state of Georgia taking so much control of MARTA is inescapable political responsibility. If one wants the state to “man up” and do the right thing by MARTA, then allowing the state to be responsible might be the right way to go. The next logical step would be for the state to increase its funding of MARTA to acceptable levels for a state that still lays claim to the title Empire State of the South. Is this a bargain that MARTA can’t afford? Perhaps, after all, it is not. My father, actually a man of few words, might offer another bit of sage advice to MARTA supporters, “If you want a man’s help, then make your interests his interests.” Yeah, that bit of wisdom would certainly fit. There is much more at The Saporta Report, so check it out to get additional information. This is not the only issue with the draft legislation that is discussed. You’re big boys and girls so you can wander over there and find your way back again. For the weary, here’s the link. the emissions blamed for global warming. And the power plant that emits the most greenhouse gases in the U.S. is Plant Scherer in Juliette. The plant is operated by Southern Company . The coal-fired plant reported releasing nearly 23 million metric tons of carbon dioxide, the chief greenhouse gas, in 2010. This should not be a surprise. 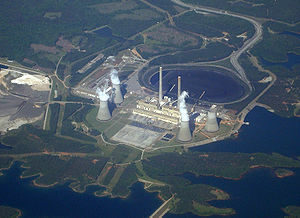 Plant Scherer is the largest coal-fired power plant in the Western Hemisphere, the fifth largest power plant in the US of all types, and produces 3,500 megawatts of power. It takes three train-loads of coal per day to fuel the the coal-fired power plant which has a turbine room approximately a mile long. First let me say that I encourage my friends on the left and middle, as well as fellow conservatives to critique this list – and hopefully add to it. The state legislature will convene in a few days, and I’m sure they are all waiting breathlessly to know what we citizens want. What do you really want? Please share your ideas. Dear Georgia Legislature, The citizens of the state, with a few exceptions. have been good this year and so they deserve some consideration. Here is my Christmas wish list for the state of Georgia. I hope you’ll look at it carefully. 1. The state needs to give individual counties the flexibility to increase the limit on local option sales taxes subject to the same current restrictions (other than the overall cap) but limit that authority to the next five years with tax receipts to go into the local government’s general fund. Some poor, rural counties may need this to remain financially viable in this economy. I don’t like increasing taxes, so if there is a better way, I’ll certainly accept it. 2 – EVERY department at the state level needs to implement zero-based budgeting. 3 – Stop thinking about education in its present form. Look for alternatives that work whether they are within the current framework or not. Look at eliminating grade-levels so that students can work at different levels within each subject matter without regard to age. Grade levels stifle students in their best subjects and bewilder them in the areas in which they struggle. Could you please pass legislation making it possible to fix this? There’s a rule of thumb that says if there is no organized opposition to a local tax or project then it will pass. If there is any organized opposition to Georgia’s one percent regional transportation sales tax, then I’m unaware of it and so are those polled. While not a surprise that a majority approve, the margin was impressive. The poll of 1176 registered Georgia voters was an 11Alive News Survey that showed approval across the state with the exception of the area defined as North / West Georgia, where the survey shows a 47/47 tie with six percent undecided. This region may have been influenced by the self-identified party breakdown among voters. While Democrats favored the poll by a wide margin 70/24 with six percent undecided, Republicans opposed it 41/53 with, again, six percent undecided. I do not have the tabs on the poll or the margin of error, but it appears to me that this is a significant margin. Overall, those polled favored passage of the tax by a 55/38 margin with seven percent undecided. Somewhat surprisingly to me was that the highest level of approval was for the region listed as South / East Georgia where the margin was 60/35 with (you guessed it) six percent undecided. Who are these six percent anyway? This was slightly higher than the Metro region though the margin was one percent less. So, will the transportation tax pass? Do Georgia voters understand what they will and will not get from passage or do they see it as a panacea for all that ails Georgia’s transportation ills. If so, will there be a backlash when they learn that there is a projects list already in existence? Discuss among yourselves and try to make it interesting, the legislature might be reading. More details of the survey results on the 11Alive site.